Last month I had the pleasure of getting to know nine other Wisconsin farmers’ market managers as we came together three times in person and several more times virtually online to complete the Market Manager Certificate Program offered by the Michigan Farmers Market Association. During this program, we learned important skills and ideas to improve our individual markets, which run the gamut in size and location. My favorite times were the in-person opportunities. We came together in these classes to share our struggles and successes, get input on our concerns, collaborate on our policies and procedures and even to practice our presentation skills. Throughout the process, I couldn’t help noticing the high ratio of women in the role of market manager. In fact, nine out of ten Wisconsin participants were women. It made me think about the increasing role that women play in local agriculture. Women in agriculture are either a growing trend or being counted more often, depending on which source you consult. Certainly, women have historically done their share of farm labor. According to a 2013 USDA bulletin, however, the number of woman-owned farms nearly tripled over the last three decades. Some of the increase can be attributed to the inclusion of data from small farms, which increased the number of both male and female-run farms. Since the majority of woman-owned farms are in the small farm category, the rise of farmers markets’ also plays an important role. I thought it would be interesting to take a look at our own numbers. Of 40 businesses in the farm vendor category last year, 17 applications list a woman as the primary contact person. Nine more applications include a woman as one of two primary contacts. This is higher than the national average, which shows that women make up 30% of farmers overall. The high proportion of women-run farms at our market is not surprising when we look at why vendors choose a farmers’ market over other sources of income. 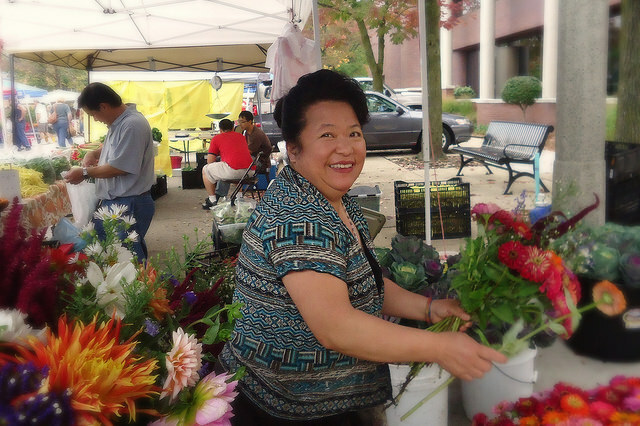 In a recent survey of JFM vendors, 98% consider building relationships with customers to be an important part of their decision to sell at a farmers’ market. Women are choosing to farm (and to manage farmers’ markets) because we are good at these jobs and find them rewarding. We do these jobs for the betterment of our communities. We do these jobs because we care. In addition, we bring valuable skills to these jobs, such as relationship building, management, conflict resolution, multi-tasking and marketing. For some inspiring stories about modern women in agriculture, check out The Female Farmer Project by photographer Audra Mulkern. This project chronicles the stories of several female farmers who are making a positive impact in both urban and rural agriculture. “The mission of the Female Farmer Project is to document the rise of women in agriculture. I share the images and the stories of women who farm. Some of these women are first generation farmers who come from the corporate world; lawyers, anthropologists, executives, scientists who are bringing a unique skill set to the farm. Some are third or fourth generation farmers but bring a new vision and fresh ideas and are responding to the needs of today’s economy by diversifying the farm income.” – Audra Mulkern, in an interview for Huffington Post. National statistics show that many female farmers also maintain an off-farm job. Though I don’t have exact statistics for our market, I can say from talking to farm vendors that many of them, both male and female, also work off the farm. There is a growing concern that farming, especially on a small scale, cannot pay a living wage. This begs the question of whether we are seeing more women in farming because they are taking the jobs that men don’t want to do. This is a question that also comes up with regard to the job of farmers’ market manager, which tends to be an under-paid position with part time hours and great responsibility. On a positive note, there is a growing professionalization of farmers’ market managers, which leads to greater sustainability and success of the markets they manage. Good management is a key to market success in an increasingly competitive environment. The Market Manager Certificate Program seeks to address the need for professional market management, which is key to the success of not only markets, but the farmers who depend on those markets. In our own vendor survey, market management came up as the second most popular factor in choosing to vend at a farmers’ market, with 97% of survey participants rating good management as an important consideration, and 92% rating “market is well-managed” as very important. The next time you are at a farmers’ market, pay attention to the demographics of the farmers. Do you see young farmers? Do you see women? Do you see minorities? I think you will be surprised at the diversity that a farmers’ market encourages and supports. Talk to the farmers. Ask about off-farm jobs. Ask them what they enjoy about farming? What is their favorite thing to raise or grow? How long have they been farming? This face to face interaction is what sets farmers’ markets apart from other places we buy groceries. While income disparities do exist and must be addressed in any thorough discussion of the sustainability of our local food systems, they are only a piece of the picture. Certainly, making it more profitable to grow vegetables and raise animals for food will help to attract young people, including young women, to agricultural careers. 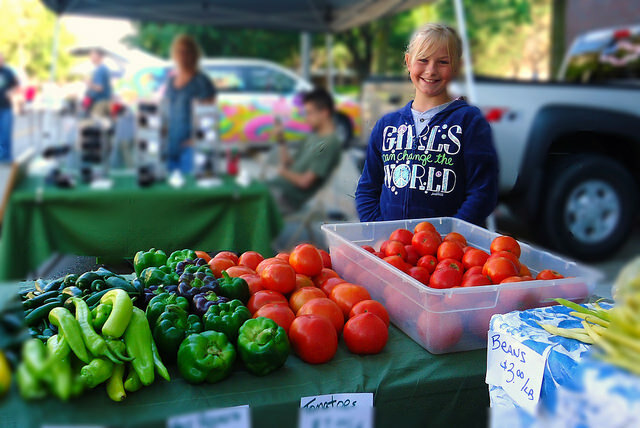 A strong farmers’ market can help make farms more profitable. As a farmers’ market manager who interacts with local farmers on a regular basis, it is clear to me that women are choosing to grow food for people (and to manage farmers’ markets) because they really enjoy the work. They enjoy the relationships, the food, the lifestyle and the other rewards that cannot be measured in economic terms. The same is true for market managers, who tend to be passionate advocates for our markets, our communities and the farmers we serve. This passion is a good thing. Is Local the New Organic?